When it comes to the camping world, one of the benefits of the whole experience is being able to re-immerse oneself with nature. Elsewhere, it’s also an opportunity to spend time with loved ones without technology. It’s hard to remember what our friends’ faces look like without the reflective glow of an iPhone screen playing with their eyes. While we do recommend limiting technology on such trips, it’s hard to ignore BioLite. 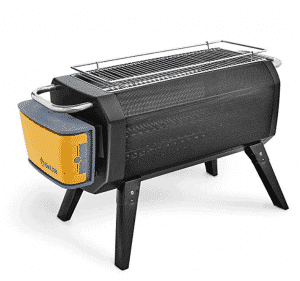 As a technology company from Brooklyn, their most popular product is perhaps the CampStove. Why? Because, rather than burning gas, it burns twigs and branches. What’s more, smoke is eliminated, flames are optimized with an onboard electrical unit, and all devices can be charged with a USB port. See The Biolite Smokeless Firepit in action before you read our full review! However, this is just the start because BioLite has also produced portable batteries, lanterns (with Bluetooth capabilities). And it has solar energy units for those who plan to turn their camping trip into a permanent lifestyle. Air is injected into the closed container (this is achieved with an external battery-powered unit). With the air injection, the flames burn more efficiently, and smoke is reduced. Overall, the whole design is bigger and the flames themselves are held within a closed container. If you want to cook, the grill top will have you covered. Finally, how could we not mention the ability to charge phones, tablets, and e-readers? Now we have the basics, why should you consider this portable fire pit? Firstly, this particular unit is able to provide a campfire but without all the smoke that normally comes with it. At first, we were skeptical about the air injection system, but it really does work. Even for those who rarely spend time outdoors, the air injection allows for optimal flames that are easy to control and utilize. Since it’s a portable fire pit, you can use it in the backyard before then taking it on trips to campsites and beaches. In the past, we’ve even seen people get out their BioLite FirePit in parking lots while tailgating. Just in case you needed any more reason to consider this model, you’re able to charge your phone and cook simultaneously. On the other hand, there are a couple of drawbacks of which you should be aware before investing your hard-earned money. Firstly, the fire doesn’t use a closed loop to maintain the charge of the battery system and this is a shame. With the BioLite CampStove 2, both the air and battery systems are in a closed loop and this makes the product even more effective. 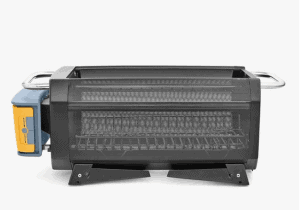 In case you haven’t seen, the CampStove 2 uses a thermoelectric system. With this installed, heat from the flames can be converted to energy and a portion of this stores in the battery. From here, the fan has power and there’s no real need to charge it. Although this doesn’t exactly break the experience, it is a shame that the FirePit doesn’t offer this feature. Therefore, you’ll need to remember to maintain charge in the power unit. With the second drawback, it will only affect some people and it depends on which type of product you require. In the BioLite FirePit, the flames are contained within a box, which severely reduces the amount of heat it provides (when in direct comparison to a regular campfire). While some will find this frustrating, others like being able to snuggle up to the box. Even when on full power, they can sit next to it and get a more concentrated heat. For larger groups, however, this might be a little more difficult. Before we head into more of our BioLite FirePit review and assess some of the features, are there any similar products in the market? In truth, we don’t believe there’s anything that can quite compare. If you’re willing to invest $300, Solo Steve’s Bonfire uses a similar air injection system to minimize smoke and boost the flames. Meanwhile, the $90-$100 Primus Kamoto has similar features. However, neither of these have been designed (or optimized) for grilling and they also don’t have effective thermoregulation systems. Therefore, they can’t compete with BioLite and what seems to be a more ‘complete’ product. For centuries, millenia even, it has been human nature to sit around a campfire. And you could even say we get enjoyment from it. Mesmerized by the flames that lick the air, they provide function as well as something to watch whether camping in your own back yard, the woods, or in a huge field far away from home. In the 21st century, much has changed, but our love for flames remains. For those who have been camping for many years, you’ll know that fire pits aren’t exactly a new idea. Therefore, why should you even pay attention to the BioLite FirePit? We believe it’s revolutionary. Standing on four legs, the unit is rectangular and holds a patented airflow system on the end (something you won’t find with any other brand). Often, camping can be frustrating (and even dangerous to health) when thick smoke surrounds the area. We understand, you’re a little nervous about Bluetooth and batteries because it’s bringing technology into a world that has so far resisted the urge to ‘scratch the itch’. However, we also believe that this form of technology is a positive one. Considering it clears smoke and prevents stinging eyes, it’s a sensible use of technology and one that makes camping more enjoyable. After seeing all the positive reviews regarding the BioLite FirePit, we decided to have a go ourselves. The basics are still there; you’ll need tinder to start (paper, of course, don’t go grabbing your phone!). After this, you can build on the fire and eventually use proper logs. You’ll be able to squeeze in four full-sized logs with the FirePit. Until now we have a fairly standard fire, right? Well, all that is different with the FirePit is starting up the air jets as the flames take hold. Once you hear the soft hum of the unit, you’ll know the jets are on. Suddenly, you’ll see the flames have a bit more energy than normal. What we like about this product is the simplicity. If you’re in a rush or perhaps don’t have so much experience, it’s very rare that you’ll have to scrap the fire and start again. Instead, the 51 air jets aid the process and fan the small flames into a full fire in no time. Rather than being a huge chore and something you dread, starting a fire with the BioLite FirePit is almost a pleasure. In the early stages, you’ll notice that there’s some smoke, but this is normal. As soon as everything settles down and the air jets start combusting, you should notice a significant decrease in the amount of smoke. Once the fire is up and running and you start relaxing for the evening, this is where one of our drawbacks can become noticeable (when with a group). We could feel the heat, but we needed to huddle around the unit to really feel the benefit. With the barriers around the flames, this is always going to be a downside. Yet, we were able to roast marshmallows without singeing our fingers. And we also shared funny stories being so close together. What about the cooking? Great question. We tested this one evening. As the sun started to set, we replaced the firewood with charcoal and placed a rack of ribs on the grill. In all honesty, we were all surprised by how quickly they cooked. We weren’t restricted by the small surface area (something I thought was going to be a problem). Considering we had been using a very basic charcoal burner to cook food until then, we instantly knew that we had a replacement. Should you invest in this product? If you see people speaking negatively about this product, we assume they tried to replace their campfire with it. Since this is a portable fire pit, it’s probably a little too much to expect it to replace a full campfire. This being said, it’s one of the best portable fire pits we’ve ever seen and thoroughly enjoyed using it. With the brilliant air jets, maintaining a flame has never been easier and cooking is faster too. It was nice being able to look at friends without stinging eyes, but the lack of heat may be a problem for larger groups. All in all, the FirePit would be perfect where a ring of stones isn’t available; we highly recommend the model for tailgating, backyards, and other trips in small locations and with limited people! PrevPreviousThe Top 5 Camping And Fishing Kayaks On The Market Today Full Review!